For Kenya, police don arrest another opposition lawmaker. 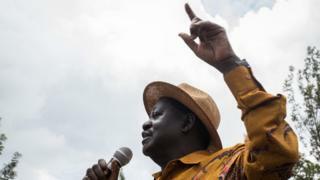 Di arrest get connection with last Tuesday waka wey former Prime Minister Raila Odinga swear imself in as people's president of Republic of Kenya. Local media for Kenya dey report say police officers gbab George Aladwa wey be lawmaker for Makadara for im house and dem carry am go di directorate headquarter to ask am question. Aladwa na di second member of parliament wey police don arrest dis week on top Tuesday parole of Raila Odinga wey Western countries and di African Union don yab say e no correct. On Wednesday dem bin arrest one oda lawmaker, carry am go court, come later release am for bail. On Friday police bin arrest opposition activist and Canadian based layer Miguna Miguna, as government begin chase opposition politicians wey get connection with Odinga. Miguna still dey for police net.